Glenn Honda was fishing alone using a 13-foot Nitro pole, Newell 646 reel and 80-lb test Ande line when he hooked his monster ulua. After an epic battle, Glenn waded into the rising surf and leadered the giant fish. A set of 5-foot waves washed Glenn and his catch over the jagged shorebreak and onto the shoreline. 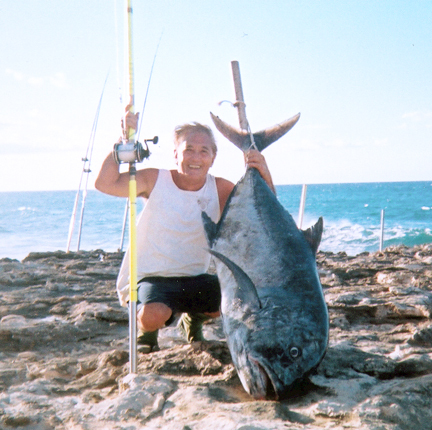 This is Glenn's second 100-plus-lb ulua.